At every book signing, one hand will raise and ask this question during the Q&A following a talk: Where do you get your ideas from? I personally (and I know I’m not alone in this) hate that question. Because basically I don’t know, and I fear if I look too closely at the process it will evaporate and disappear. And I don’t have enough talent to take such a risk. I do know that I always have my antennae up for that next seed for another novel. I collect these ideas in a cardboard file box at home: articles I’ve ripped out of magazine, notes jotted from watching a documentary, handouts from a lecture I’ve attended. It’s messy and disorganized (and probably has families of mice nesting somewhere down deep). But I like that chaos because strange tidbits end up mixing next to each other: that bit of science and that scrap of history. Connections come to mind that would never have risen by imagination alone. In the case of The Eye of God, one of those “seeds” arose from an invitation to attend a private tour of Fermilab (the national particle accelerator lab) outside of Chicago. It was a wonderful chance to explore the world of neutrinos, high particle physics, and the mysteries of the universe. Over lunch I was seated with a group of physicists and had a chance to ask them a question I often pose to scientists when given the chance: Tell me something about your research that scares you, that keeps you up at night. After a bit of indigestion, I began to get an inkling for a story. One of the physicists raised the supposition that nothing in the universe was real—that everything is just lights and shadows, virtually a hologram. In fact, Fermilab is perfecting a device called holometer this year to test if the universe is in fact a hologram. The general consensus of the group was that this theory would be proven true. To elaborate on this, they shared a quote from physicist Brian Greene about the unreality of reality, demonstrating how little of the world is solid. To paraphrase: “If you remove all the dead space inside atoms, every person whoever lived on the planet—from past to present—would fit into the size of a baseball.” That’s how little of us is solid versus shadow and light. Still from that very tiny seed, The Eye of God grew. I paired up this scientific speculation with historical mysteries surrounding Attila the Hun and Genghis Khan, along with the conclusion (dare I say, climax) of a long-going romantic thread of the series, answering the age-old question: will they or won’t they? between Oklahoma City and Wichita, Kansas. It’s been an interesting means of conducting a book tour. Rather than flying from place to place, I get to see a bit more of the country, and it allows me to hit smaller towns and venues, which has been a great deal of fun. Of course, it has created some challenges. Like yesterday I had to do a phone-in radio interview by cell phone, but the unusual acoustics of the rocking and rattling bus required some accommodation. In this case, I ended up locking myself in the bus’s tiny bathroom and bracing myself inside there. Guess there’s a first time for everything. So what’s the strangest or hardest question you’ve been asked on the road, at a signing, or online? The one question I oddly get asked all to often: Boxers or briefs? Unfortunately, some mysteries will remain unsolved. DEBS: Um, have to admit I've never been asked that one... What about you, fellow REDS? And readers (and the writers among you,) what's the strangest question you've either been asked or heard asked of an author? I like when pieces of history, but not necessarily tons of it, work their way into books. What I enjoy is the depth that even a little history gives to the story. Debs is also very good at that. It adds to the sense of place in the setting and with that the depth of the characters. I enjoy hearing writers talk about their books. That's almost always more interesting to me than the Q&A, although I like that part too. My favorite question of an author was at my school when a student asked the Dalai Lama if he had any special advice for students regarding prayer. His answer was, "Study hard. Prayer is important but will not take the place of hard study." 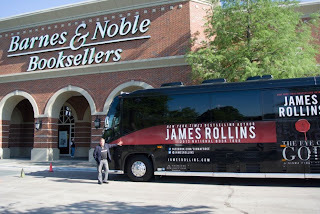 The story sounds great, James, but that bus has me jumping up and down, shouting at my wife to come look. Wow! Shania Twain and Tim McGraw have nothing on this author. Hi, James. I had the pleasure of meeting you at the Pennwriters conference a couple of years ago. At the luncheon talk, you shared your author's journey with helpfulness and humor. We loved you. You should come back! As to a difficult questions, lately I've been asked how long it takes to write a first draft. If anyone has a generic answer to that, please share. All I have is the enigmatic (and unhelpful) "It takes as long as it takes." That was such a good question to ask the scientists James--damn, I'll have to remember that. Me too on the bus, Debs. Wouldn't it be fun if it was the Jungle Red Writers logo on the bus???? That bus is quite something. 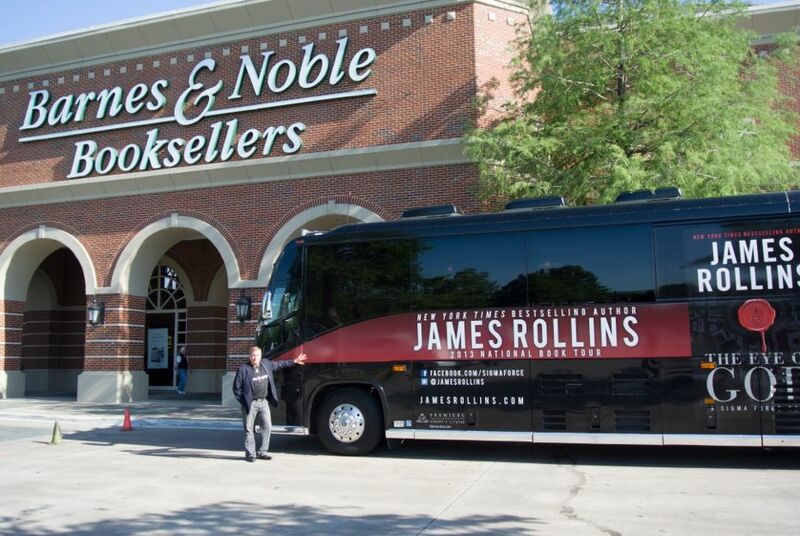 Looks like a fun way to travel for a book tour. As for a JRW bus, I'm not sure one location can handle all of you wonderful ladies arriving en mass. Though I suspect if you did, you'd have a few of us following you around like groupies. I'm off to Santa Fe for vacation! Jack: I kept referring to the bus as "The Beast," and it was. From talking to the tour guys, I guess prior riders of that same bus were Hilary Clinton and Mitt Romney. So I guess that makes the bus an independent. Hi Ramona! I had a great time at Pennwriters, too. Now only if they would hold it closer to the West Coast (grin). As to the "how long does it take," I like your answer. No need for another. Lucy aka Roberta: Yes! Get a bus! Kristopher: Sante Fe sounds great. It's supposed to be 108 here today. May have to escape to the mountains later on today too. And wow, it's fantastic, I'm all in for the JRW bus tour. Wow. My weirdest question...hmm. What name would I have wanted if I could choose any other name for myself. SO strange..and fascinating to think WHY someone woud have asked that. James, so wonderful to see you! What do you say to an embarking bus tour guy instead of bon voyage? Bon bussage? Okay now I know. We need a Jungle Red Bus! Welcome, James. I'm going to be doing a lot of thinking about this theory of hologram and now I HAVE to read the book. 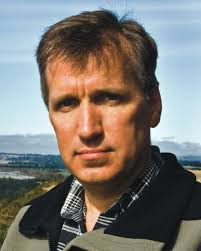 A Mystery Writers of America prize for best novel had always been my boss' goal. Now it's a bus. Okay, I think we've made it clear we all want the BUS. But was it fun, really? And how many cities did you hit? When I asked who was the nicest person he'd ever driven, he said, "Willie Nelson." Not surprised. One more question, Jim (but don't hold me to it...) I love the characters from Bloodline, Tucker Wayne and his military working dog, Kane. Anymore adventures coming up for them? I found the short story, Tracking, on Amazon, and really enjoyed it. I want THE BUS! I tried to get my hubby to do a bus tour with me -5303 resthu no dice. But I'm in if the Reds want to do it next spring. Weirdest question - what's wrong with my tomato? 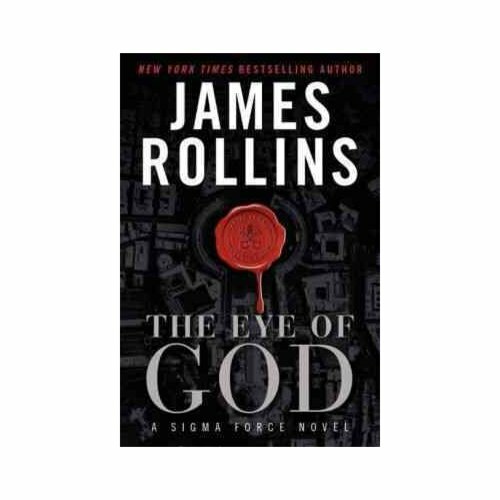 HPR: Oddly I get that question asked too, which is especially strange as "Rollins" is a pen name already. Rhys: During my book talks during the tour, I explain how the universe might be a hologram by asking for a volunteer from the audience (with the caveat that they have to tell me their weight). Then use that quote from Brian Greene to prove they don't really exist. Always good for a chuckle. Deb: we hit around 14 stops during the 6 days, generally 2-3 book events per day, with around 3-4 hour driving between. Made for long days but it was fun (and no TSA lines!). Synopsis (since you asked): A military research satellite inexplicably falls out of orbit while investigating a passing comet. As its burning through the upper atmosphere, it manages to get off one last transmission: a satellite photo of the Eastern Seaboard, but every major city is on fire or destroyed. Is it a fluke or a glimpse of what's to come. How that all relates to a holographic universe, the Book of Genesis, Genghis Khan, and one pesky falcon? That's the fun of the book! As to Tucker and his military war dog Kane, they'll be reappearing in their own solo adventure next April (titled The Kill Switch). I loved writing that pair after seeing such duos in action during a USO tour to Iraq and Kuwait. As a veterinarian myself, how could I not talk to those guys and their dogs and want to put them in a book (or two)? Rosemary: So what is wrong with your tomato?!? MY tomatoes are fine, thank you very much...hers had blossom end rot. So James...how many stops and where will you be this week? Should readers check your website for details?? Love the bus. Never to have to deal with airport security... now that would be a treat. So the world's a hologram? Why not? Physicist are weird (I'm married to one) - they take seriously concepts lke parallel universes and dark matter, no less ridiculous sounding than a holographic universe. Which of course reminded me of Star Trek's holodeck, and the wonderful episode where the crew traps the nefarious Moriarty in a holodeck program and he lives happily on never aware that he's been captured. I just had a discussion with my science-oriented youngest about The Strong Force (while we were waiting for the 4th of July concert to start!) so I guess physics are in the air. 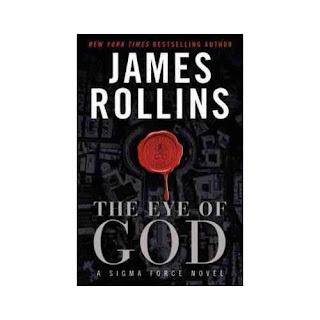 THE EYE OF GOD sounds great, and I'm really excited to see that Tucker and Kane will be coming back. I loved them in BLOODLINE. As for the bus, if it had a/c, I'd move in. It's freaking 92 degrees here, and like many, many Maine households, we don't have air conditioning. Sorry for the delay in responding to the last couple posts. A slew of radio interviews, followed by having to deal with a pair of very annoyed Golden Retriever teenagers who felt they were not getting enough attention, kept me busy until an evening local book talk. Rosemary: The bus tour finally ending, so now I'm having to hoof it: I've got a couple Northern Ca events then I head to San Diego for the riotous event that is Comicon. Then that is it! Hallie: Yes, physicists are weird (delightfully so). Julia: I returned to 108 degrees in Northern CA. But at least we have air conditioning. Though the dogs have the annoying habit of sprawling on top of the air vents and hogging the cold air. PS: I agree physicists are weird. I married outside my artso family looking for something solid. My mother-in-law and brother-in-law were physicists. Thank the eye of god my husband is just a rocket scientist. All he has to do is make the thing find something that is really there.